Druid Hills Youth Sports (DHYS) is an all volunteer organization dedicated to providing the opportunity to develop baseball skills through team sport participation in an environment of instructive yet competitive play for children who live in the area. DHYS develops these skills by providing training programs for its managers and coaches as well as for players. DHYS strives to develop the player's character through effort and sportsmanship, and emphasizes the enjoyment of baseball. Parents of players are considered a vital and integral part of the DHYS experience and are encouraged to participate as managers and coaches, team parents, or in the many other volunteer capacities. 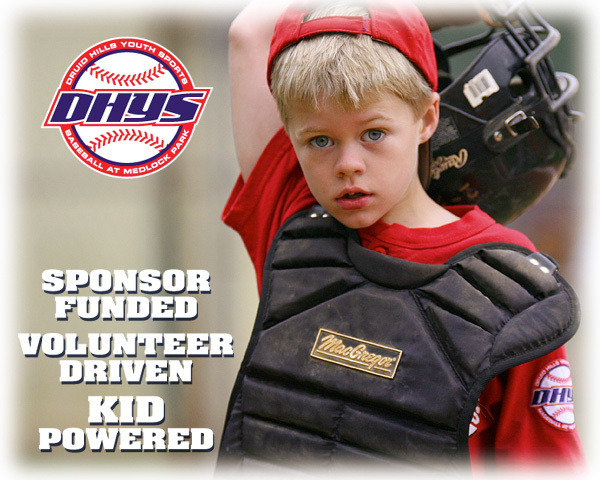 DHYS is a 501(c) non-profit organization* and is affiliated with both Ripken Baseball and Dizzy Dean Baseball. In 2012, we celebrated 50 years of providing safe, fun and competitive baseball to the children of DeKalb County and Decatur. Please click here to review the by-laws of DHYS. Druid Hills Youth Sports is an all-volunteer organization. We accept donations of any amount to provide for those services Dekalb County cannot provide to support our baseball activities. Many of the projects we have initiated and maintained at the park include our soft toss area, batting cages, equipment lockers, field maintenance tools and tractors. * 501(c)(3) exemptions apply to corporations, and any community chest, fund, or foundation, organized and operated exclusively for religious, charitable, scientific, testing for public safety, literary, or educational purposes, or to foster national or international amateur sports competition, or for the prevention of cruelty to children or animals.